On the heels of the Neue Klasse sedans, BMW saw the need for a larger sedan that would comfortably seat 5, and yet would be performance oriented. They began working on the E3 series in 1965, The 2500/2800 CS machines were already available in the late 1960s, but they were coupes. The first of the sedans appeared in 1968 with an L designation for long wheelbase. 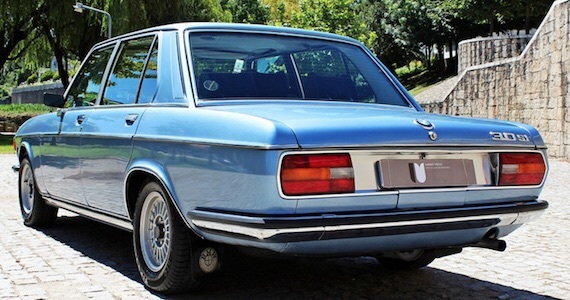 In many ways, this was the first 7 series. The machines used twin Zeniths and generated 170+ HP and 185 ft/lbs of torque. They shared the look of the twin headlight front fascia, but had a more rounded rear. The competitive target was the Mercedes mid-size sedans, and the E3 compared well with luxury appointments but more of a driver's car. The US version of the E3 was given the name Bavaria. It featured options for leather, power sunroof, power windows, and wood trim. The body was unit construction with longitudinals for greater structural support. This was in part key to the handling. In addition, it had 4 wheel independent suspension and McPherson struts up front, and semi-trailing arms in the rear. Coil springs over shocks grace all four corners. The new sedans had discs at all four corners. It had the legendary smooth straight six and handled autobahn speeds without issue except for some reported wind noise above 90mph. The trunk has copious amounts of room, and it has a generous greenhouse. In 1971, the 3.0S was introduced, which was more of a performance variant. A 3.0Si fuel injected version continued the trend of the sedan outperforming the more stylish and celebrated coupe. In 1973 a new 3.3 liter version was introduced. The E3, and particularly the 3.0S and Si variants, combined the luxury appointments of the Mercedes and Jaguar competitors, outperformed and out handled both, and established dominance of the Uber sedan category. As Road and Track put it in 1973, "For those who might not know, what BMW did, in essence, was to combine the function of a sedan with the handling, braking, and acceleration properties of a sports car. Ironically, the end result was a luxury sedan, that performed better than most sports cars."